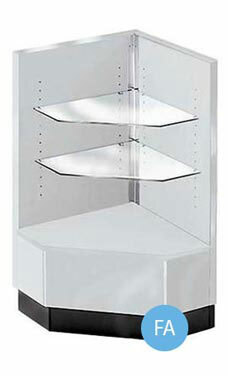 Corner display cases are useful for providing additional storage space while also tying showcases together. This particular Metal Framed Front Corner Filler is designed to match all of our gray display cases. It's constructed from a gray melamine laminate exterior, with satin finish anodized aluminum framing. Our corner filler features a 90 degree triangular design with 2 adjustable shelves to allow for additional display of collectibles, gifts or trinkets. It's easy to create a custom built-in look with a matching 90 Degree Metal Framed Corner Filler! Crating for secure shipping is included in the price of the case. Overall measurements include 38H" x 20W" x 20D". Ready to ship!